Don Cherry doesn't think the Carolina Hurricanes are very funny. But he admits their shirts are. 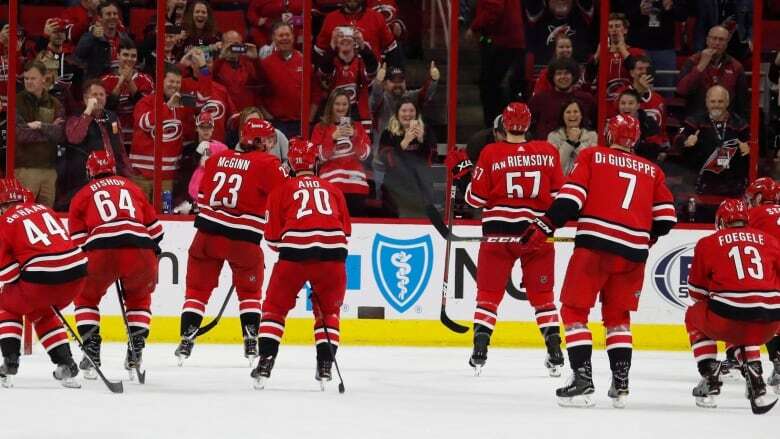 The TV hockey commentator called the Hurricanes a "bunch of jerks" on Saturday night when sharply criticizing their elaborate post-game celebrations at PNC Arena in Raleigh, N.C. The next day the team started selling a shirt with the phrase emblazoned across the chest, proudly declaring in a tweet on Sunday that "the jerk store is open." "I don't mind it, if they want to have fun with it," said Cherry with a laugh. "I'm sure some of the players are embarrassed but when the owner [Thomas Dundon] says 'be more entertaining,' I guess that's what they call entertaining." The shirts actually remind Cherry of another time he criticized a player on his weekly Coach's Corner segment on Hockey Night in Canada. "I like Pavel Bure, he's one of my favourite Russians, he slew footed Cam Neely and I called him a little weasel," Cherry recalled in a phone interview with The Canadian Press. "And they put towels out with 'Weasel Power' out in Vancouver." Although he can laugh about the "Bunch of Jerks" shirts, Cherry still doesn't see much humour in the Hurricanes' post-win routines that have included falling down like dominoes at centre ice, doing the limbo under a hockey stick, and playing duck-duck-goose. "We in Canada, at least most of the people I know in Canada, revere the game. I don't think there's any secret there," said Cherry. "I guess I'm the only guy who said it, but that's why I said it. I mean it, I mean every word. "We call the Stanley Cup the Holy Grail in Canada and here we have these jerks doing a pantomime after wins." Cherry was head coach of the Boston Bruins from 1974 to 1979, leading the team to two Stanley Cup finals before coaching the Colorado Rockies for the 1979-80 season. The Rockies were a relatively new team to Denver at the time, having moved from Kansas City in 1976. To celebrate Cherry's arrival in Denver the team used the slogan "Come to the fights and watch a Rockies game break out!" to try and drive ticket sales. "I think what Mitch Marner does here in Toronto, which they don't need, going over when the kids are down near the glass, giving them pucks and hockey sticks and that sort of things, that's great, that's how to market it," said Cherry. "Not to do silly things like being a bowling ball at centre ice or doing the hula dance or whatever they do. "To me, that demeans the sport. It's like pro wrestling, almost."